Peter Edward Cook (17 November 1937 – 9 January 1995) was an English actor, satirist, writer and comedian. 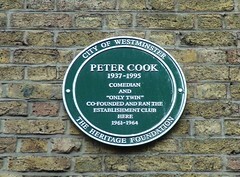 An extremely influential figure in British comedy, Cook is widely regarded as the leading light of the British satire boom of the 1960s. He was closely associated with the anti-establishment comedy that emerged in Britain and the United States in the late 1950s. In 2005, Cook was ranked at number one in the Comedians' Comedian, a poll of over 300 comics, comedy writers, producers and directors throughout the English-speaking world. "Kinbrae" Peter Cook (1937-1995) Voted one of Britain's greatest comedians and a writer of note was born here November 17th 1937 when the house was called "Shearbridge"